Do you have any special weekend plans? We're babysitting this weekend & seeing some friends that got married last month. They went on a month-long honeymoon away in a cabin in the mountains. Such quality time, fun fun. Okay friends, see you on Monday bright & early with 2 new good cheer deals! oh wow! this is soooo cute! I agree with Julie. So so cute! Great picks for spring. I've been leaning towards yellow/mustard this season, too! Love your fabulous picks. Also some Tiffany's blue and tints of "dusty pink rose" type colors. And ruffles. Ruffles aren't a color but i'm in love right now! I'm seriously loving the yellow! Yellow has been a favorite lately, though I've yet to really incorporate it into anything. And blue is always a favorite, to the point that I sometimes think I need an intervention to get me to stop buying blue pieces. Have a wonderful weekend, Danni! I'm heading up to LA for a bit today then hosting a friend who's visiting from NJ later this weekend. Month long Honeymoon in a cabin - swoon! Bright Cobalt blue - singing the welcoming of SPRING! i am totally loving yellow right now too!! it's such a good color for spring. for a new color, how about kelly green? also bright, springy, and definitely a great pop color for accents! yellow is a wonderful color, the mustard gets an A+ in my book. I say you hang on to it for a bit longer. The color i can't seem to stay away from is robin egg blue. How about you take some robin egg blue from me, and i'll borrow some of your mustard. Love mustard too! Where did you get that cute purse? Love this photo - I'm addicted to mustard yellow too! Have a great weekend! Yellow is such a great color! I see lots of kelley or even a little brighter green in my spring! 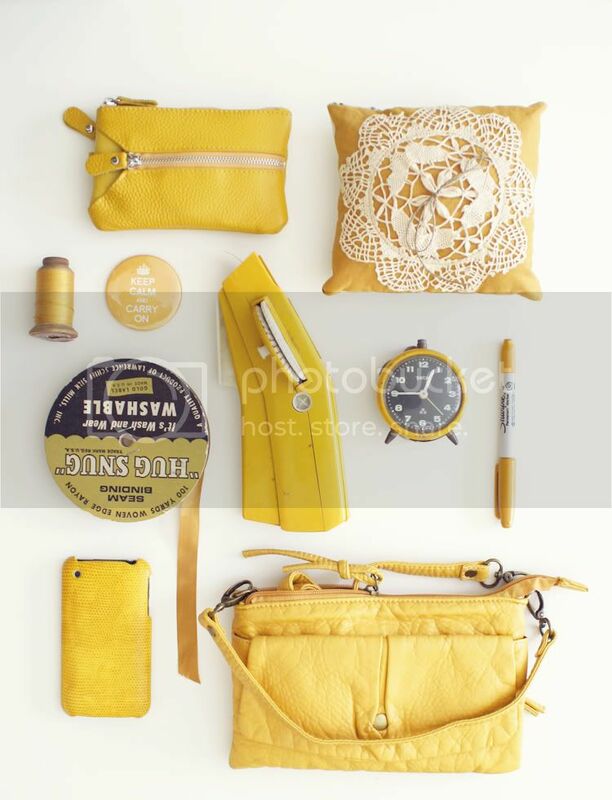 mustard is one of my favorite colors and i love this collection of yellow objects! happy weekend! first of all, wow, a month long honeymoon would be a dream. that's so special that they were able to do that! Hooray for yellow! There's nothing wrong with loving it! :) I have the same problem with green. I think I'll be doing all white, light grey and kelly green for my bedroom when I move. oooh love the mustard. Teal is a big winner for me these days too. I always love royal blue or cobalt blue! love and obsessed with turquoise as you can see in my blog. recently i've been buying a lot of warm gray. it goes so beautifully with everything... coral, teal, even mustard! So lovely! I'm a huge mustard yellow fan, but I also love lipstick red, teal and lilac. Yellow has never looked good on me so I say if you can rock it then DO IT! I'll be spring cleaning this weekend even if it snows! Happy Friday! I've always loved mustard but can't seem to find a lot of things in that color in my parts. Right now, my favorite color [and i seem to see it and find it everywhere] is magenta! it's rich bright and goes well with a lot of colors. I'm not a big fan of mustard yellow but that bag is totally winning me over. These are some cute items! I love them! I love mustard yellow but my favorite color is pink. It goes with everything! That is exactly what I was going to say! It seems to be the perfect colour for this time if year, it somehow matches the sharpness that's creeping in to the air and the beauty that is a sunny day that's not too damn hot! I'm wearing my Amour necklace right now and LOVE it! It draws compliments daily. My favorite color is coral. It's a little pink, a little orange and a whole lot of happy! And a wonderful weekend to you! Aha, I see a piece of my parents' Samsonite luggage up there on top! I love mustard too, but the giant suitcases in that set are, uh, a little overwhelming. The bitty cosmetics bag is just right! So happy I found this blog- love it! I'm going to follow!!!! Need a simple recipe or fun date idea? loving mustard so hard right now! I'm a lover of mustard color too! But also loving mint color. My nails are painted that color right now and I wanna just get more things Minty color now!! Ohh I love the little doily pillow! So adorable. I'm currently obsessed with mint/ seafoam green! seafoam/mint is a good color obsession. and it goes GREAT with mustard!! also, I have got to recommend LILAC... of course :) hehe. Which looks pretty amazing with neon yellow. I love this little collection. So cheery!